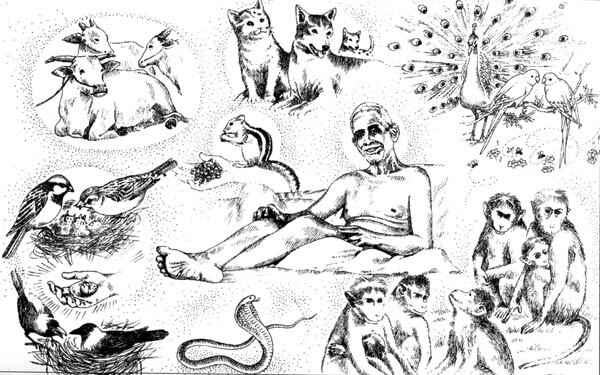 The devotees who witnessed Bhagavan Ramana’s effortless and natural sense of equality and his treating all beings alike including animals, birds and plants have expressed their sense of wonder and have affirmed that they had not seen such an instance elsewhere in their lives. 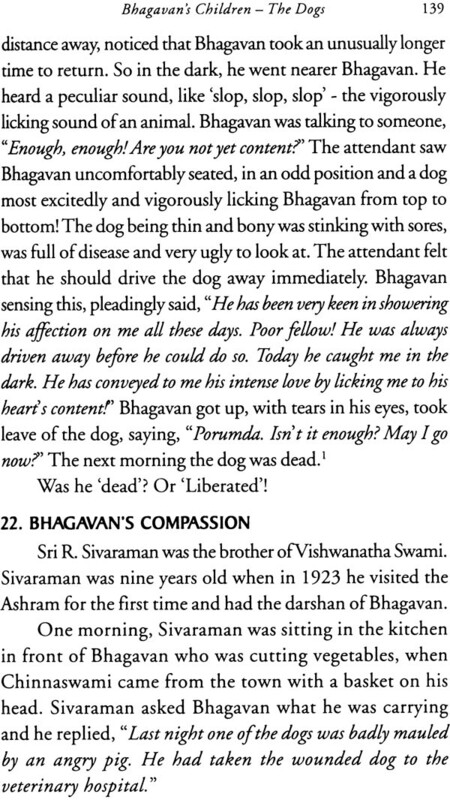 In Bhagavan’s days, his ashram was like an ancient Rishi Ashram was where birds and animals lived fearlessly and in friendship. 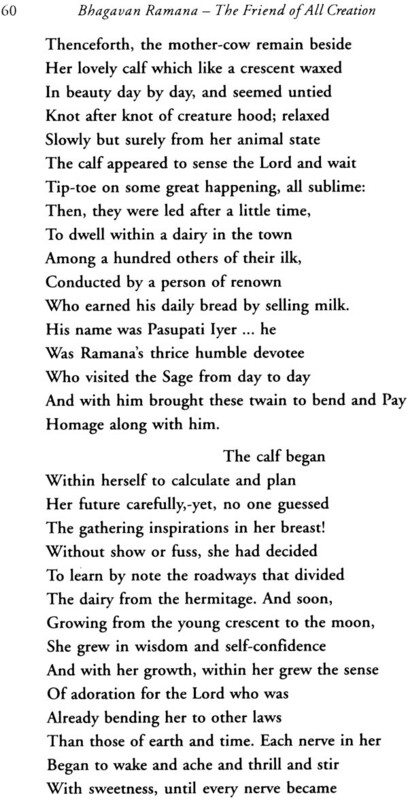 Lakshmi, the cow, would not enter the newly built goshala on the opening day without Bhagavan entering it first; so she went to the Old Hall to fetch him. 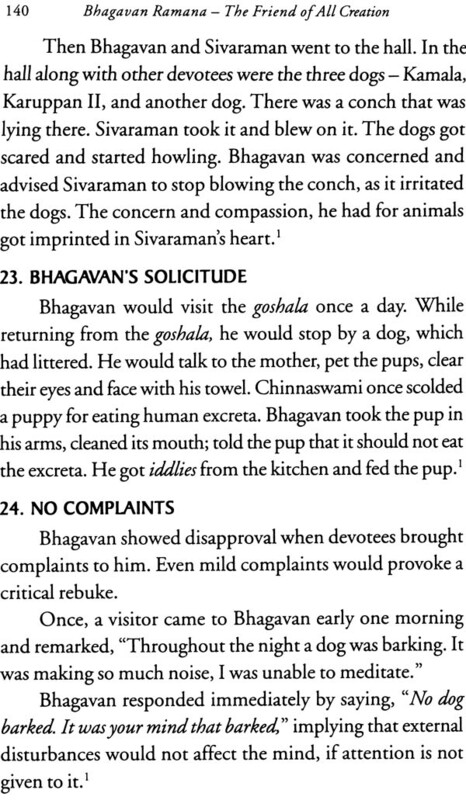 On the hills Bhagavan would arbitrate between two warring monkey groups. 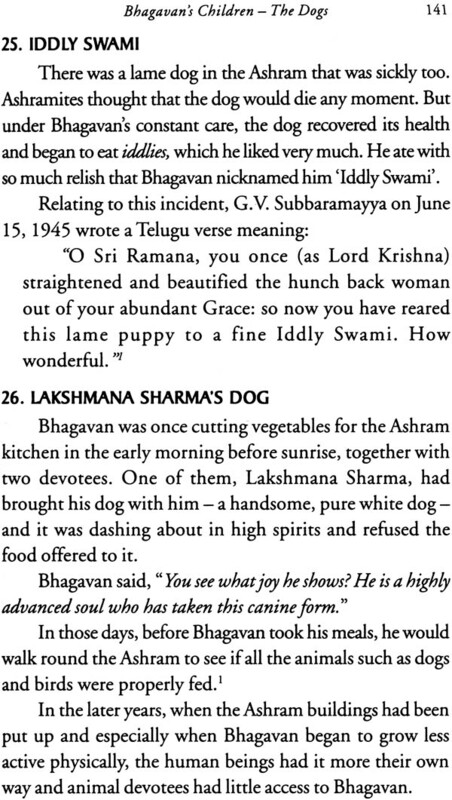 Kamala, the dog, would take a newcomer to the Ashram for Giripradakshina, when told by Bhagavan. 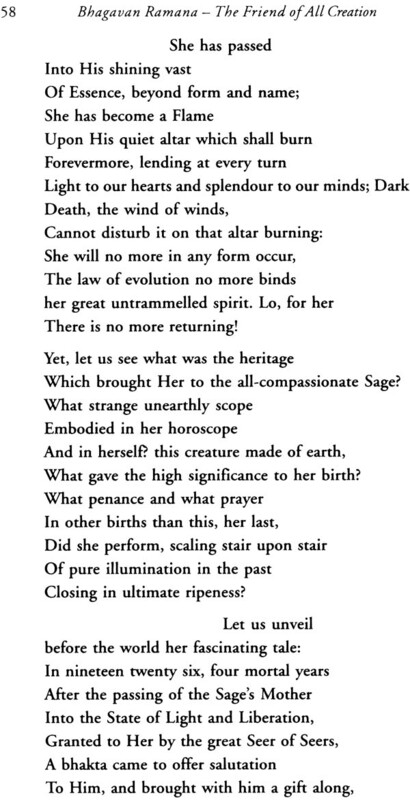 When a sparrow’s nest was disturbed, she would come, chirp and complain to Bhagavan. 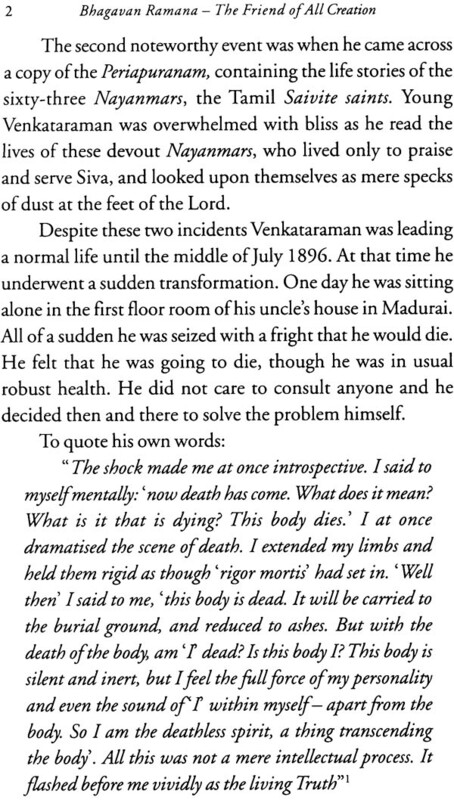 Madhava the white peacock was trained by Bhagavan to be a strict vegetarian; he stopped eating worms. 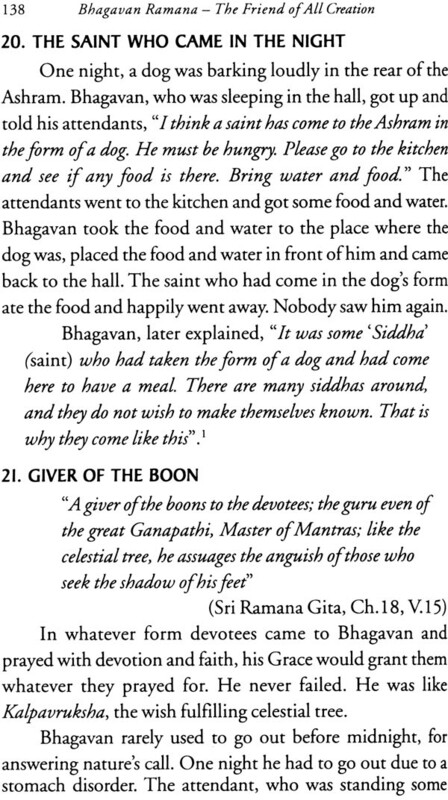 Bhagavan was their Guide and Friend. He showered Grace and Compassion on them. 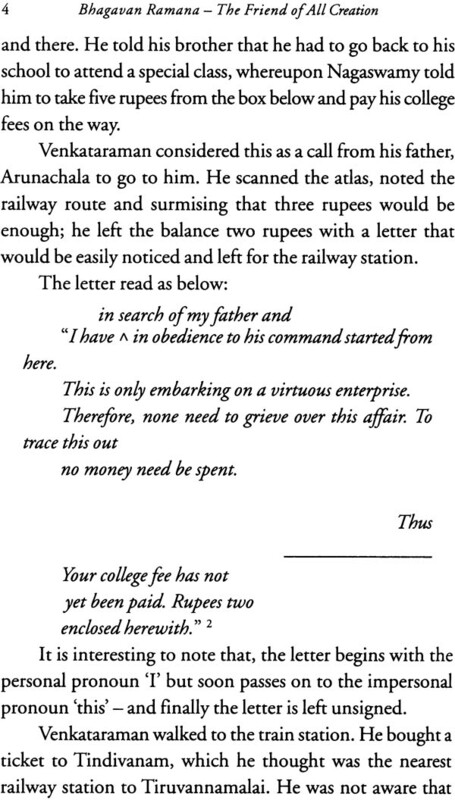 They in turn reciprocated with a love and faith, which the humans would envy. 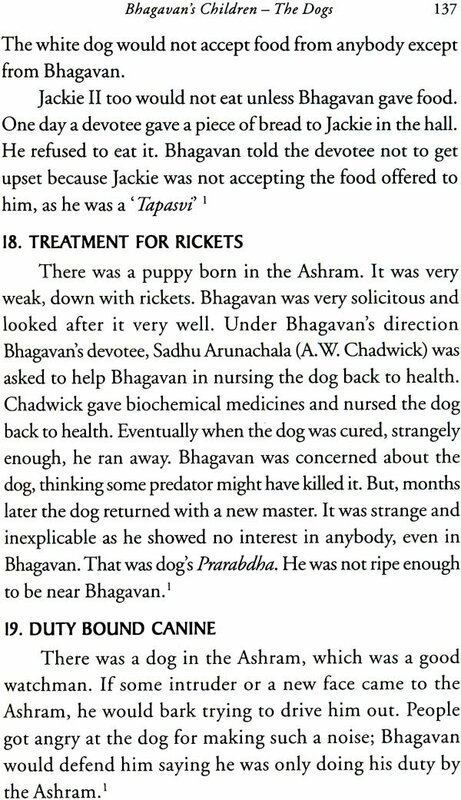 There are so many incidents of Bhagavan’s relationship with animals which inspire us to respect the entire creation of the Lord without discrimination and so surrender totally to Sadguru Ramana Bhagavan. Lord Dakshinamurti is the original Guru in the long and great teacher-student lineage guiding all earnest seekers containing unbroken to the present day. 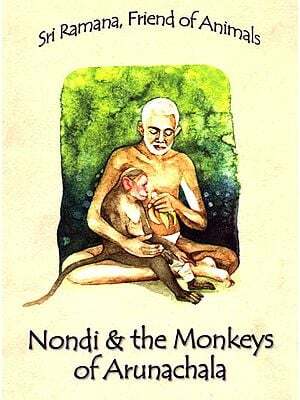 The Guru’s Grace and Compassion are bestowed not only on human beings but also on animals, birds and plants; instances of which are found in Ramayana and Bhagavatha Purana. 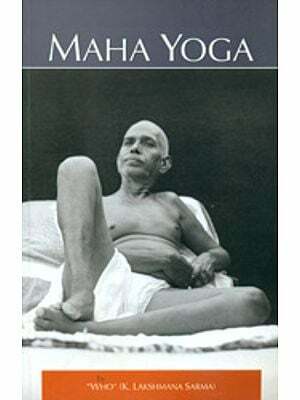 In the first half of the last century also, the devotees and the visitors who came to seek the blessing of Bhagavan Sri Ramana Maharshi were witnesses to such happenings and these have been recorded in various books. 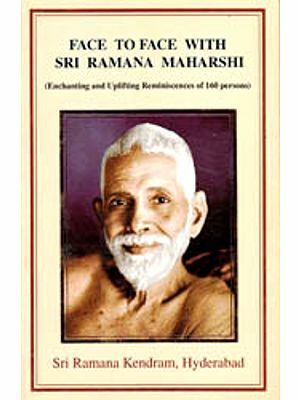 This book in which a humble effort is made to compile all those recorded incidents will show its readers how Guru Ramana all through his life bestowed his Grace not only on human beings but also equally on birds, animals and plants. 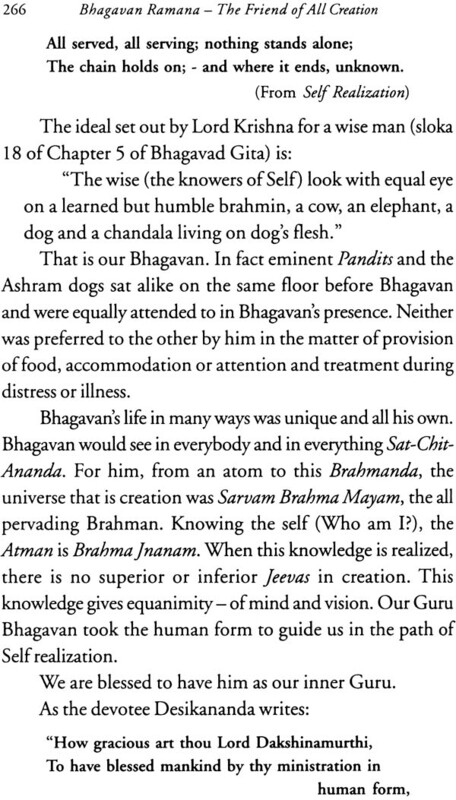 The supreme symbol of Non-dual Consciousness of this age, Bhagavan Guru Ramana, knew no duality and never discriminated as higher or lower form of life. His compassion for animals, birds and plants was of the highest order. Souls, inhabiting forms other than human, could get the Grace of the Guru, because of their devotion and diligent spiritual practices in their previous births. 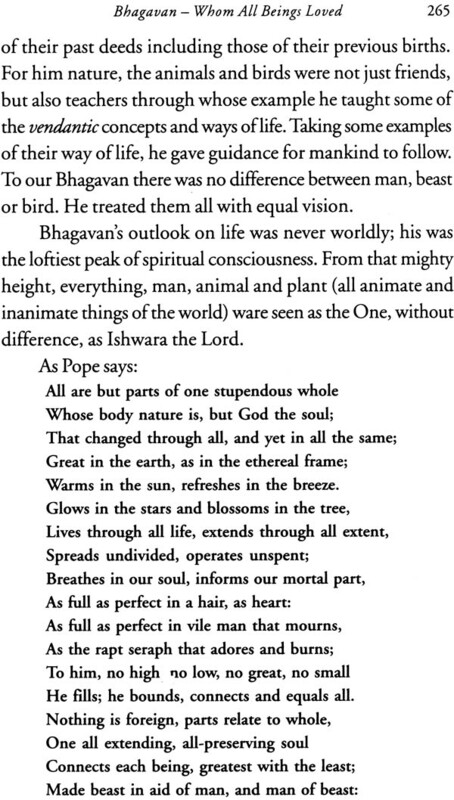 Such evolved souls were spiritually uplifted and liberated by Guru Ramana. 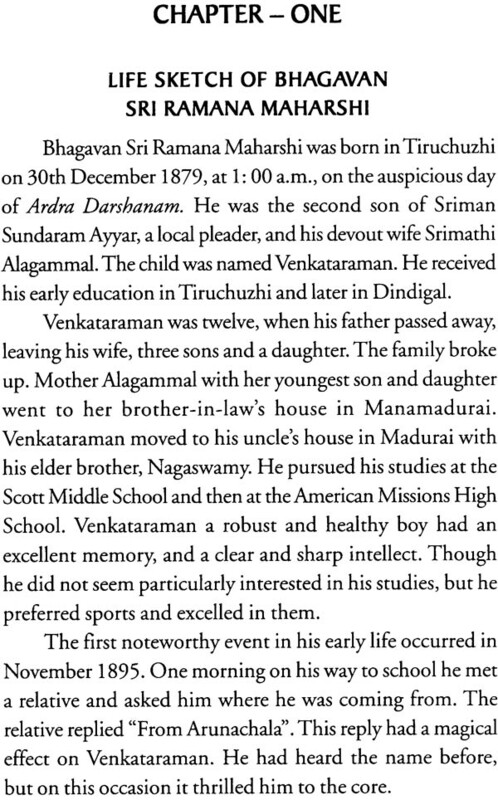 Samadhis have been built for them in Sri Ramanasramam. 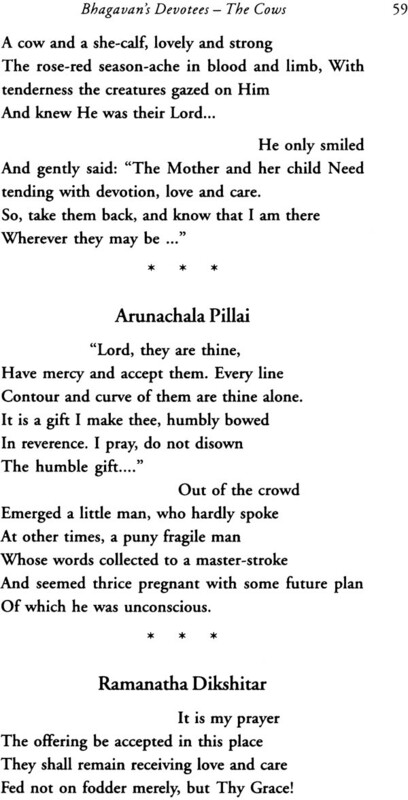 Both on the hill Arunachala and later at its foothills, the animals found in him a great compassion, benefactor and guide. 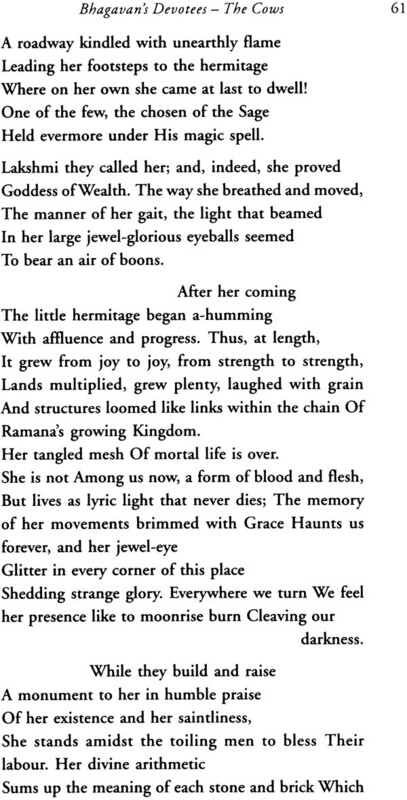 They received his love and Grace. 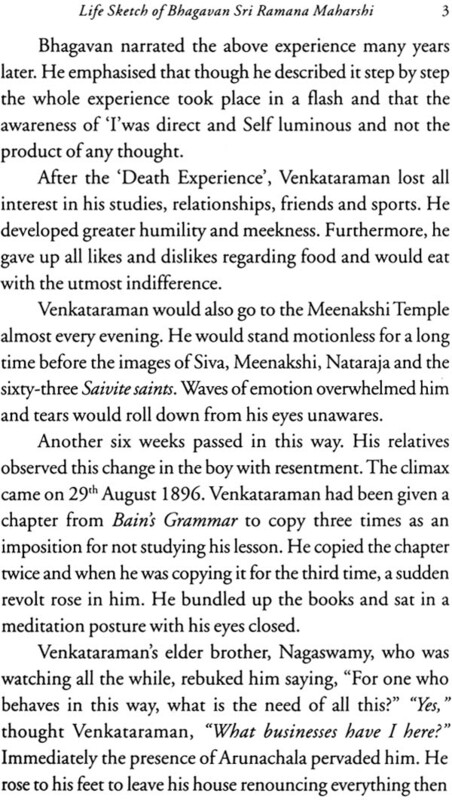 As for the Cow ‘Lakshmi’, the monkey ‘Nondipaiyan’, the white peacock ‘Madhava’, and the dog ‘Jackie’, their devotion Bhagavan Ramana was unsurpassed. 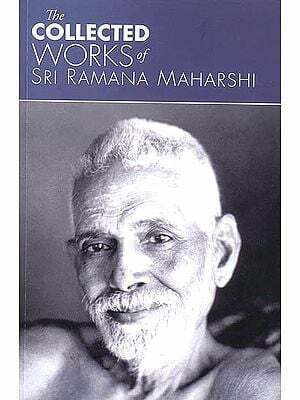 May this book serve to inspire us all to surrender totally to Sadguru Bhagavan Ramana and receive his Divine Grace.